Likely local flooding (Dec 26 2015). Re: Likely local flooding (Dec 26 2015). Having Not lived in Leeds since 1984. I cannot get my head around where the flooding is on the roads etc because changed so much.. I know where the new Southern entrance is and the river there but most of others leave me baffled. Northern Street is still closed, presumably due to the regularly blocked drains. I cannot understand why the redevelopement of the old Wellington Street goods yard site has not been taken advantage of to temporarily divert Northern Street in order to completely rebuild the drainage, and then to reinstate the road with the dip levelled out to prevent reoccurence of this problem. The dip was presumably only needed when the railway tracks of Central Station and their bridge made it neccessary to provide headroom, and now the bridge has gone levelling would be advantageous. In my post on Sun Dec 27, 2015 8:13 pm I mentioned the strange sight of hundreds of bottles on the part of Little Neville Street that joins the Dark Arches. I thought I would post these 2 photos that I took on December 27 2015. If the bottles had been deliberately placed upright then someone went to a lot of trouble to do so as the mud was very slippy (I just managed to stay upright at one point which would have been very if I had slipped!). If the bottles had remained upright naturally it was weird though! Bottles in the mud on Little Neville Street (taken Dec 27 2015). Bottles (presumably from the wheelie bins) in the mud on Little Neville Street (taken Dec 27 2015). 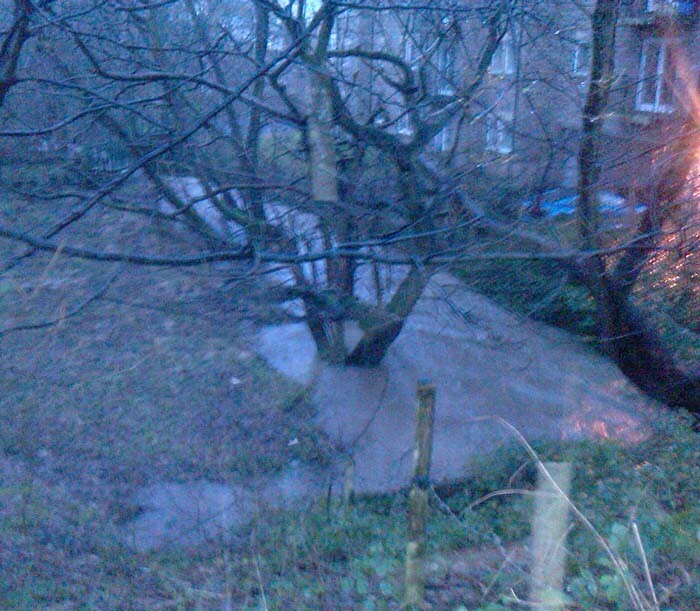 This is the shocking level of Oil Mill Beck where is runs under the ring road at Horsforth. If the water level had risen higher then the ground floor flats on the old Dickinsons Scrap Yard site would have been submerged. It seems given the appauling flooding in other areas of Leeds that these homes got off lightly! I'm pretty safe as I live on the 9th floor of a high rise tower block! 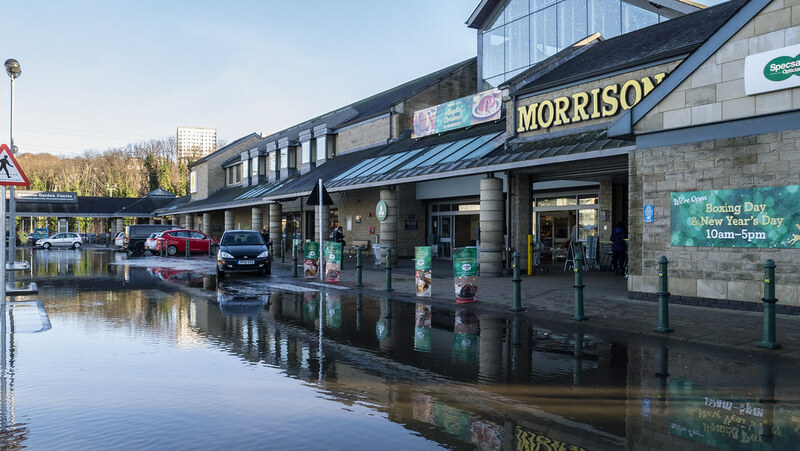 I wonder if all the business on Kirkstall Road - Morrisons / Halfords / Woodrup Cycles etc on the Kirkstall Village trading estates will be forced to dispose of all their flood damaged stock? Surely once items have been marinated in raw sewage for days its no longer legal to sell it? Hopefully their insurance will cover them for any losses? 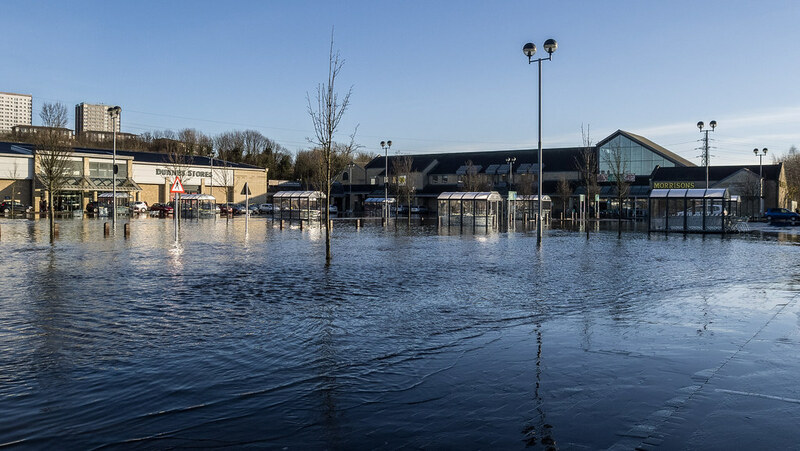 I might get down there to see if there are any flood damaged bargains to be had... Might as well someone profit from the misfortune rather than it all go to landfill maybe.. what do people reckon? Several years back there was a place called "Rainbow Restoration" located on an industrial estate close to where I live and they dealt with restoring properties after there had been a flood or fire. It appeared that the whole properties would be cleared out from top to bottom regardless of whether that particular room had suffered fire, smoke or water damage (or all three!). The range of goods which were written off by the insurance companies and just thrown in the skip was incredible not to mention very wasteful, I'm glad I was able to prevent a lot of the stuff going to landfill which would have been a travesty. Basically I was able to furnish my 'then' new flat from the place including a brand new / undamaged leather suite from Marks & Spencer, a massive (for the time) 42" Hitachi Plasma Screen Television that then would have cost over £4000 (its still going over 6 years later!) although I had to buy a fancy Logitech universal remote control with colour LCD screen built in to operate it, but I got one second hand on Ebay for £15 when they should have cost over £70 new. Also got myself a top of the range Denon HiFi which featured a DVD player and came with a pair of matching Mission Speakers, a Brother All-In-One Inkjet Printer / Copier / Scanner which was smashed to bits but worked perfectly once reassembled, all kinds of furniture - desks / office filing cabinet drawers, executive office chairs, plus literally tons and tons of tinned / packet foods, whole wardrobes full of quality clothing - casual wear / outdoor clothing / suits etc, jars of copper and silver coins, whole wallets complete with cash in notes (£120 one time!) still in them, dozens of laptop computers / mobile phones / games consoles / cd's / dvds etc etc. I could have wept when the place was relocated to Wetherby...! As well as keeping a lot of stuff myself and a neighbour would knock out the stuff cheap at the car boot sale or on Ebay after cleaning and drying out particular items and none of it ever made us poorly but I can understand why commercial businesses have to write the lot off from a health and safety position. Anyway i dont wish to gloat over making other peoples misfortune my fortune, I really hope that any people sadly affected by this flooding will have a quick recovery and that their insurance company will help restore their homes and businesses rapidly and without trying to dodge out of paying. There are people offering replacement items for affected people on the local Leeds Freegle and Freecycle websites so if anyone has any goods that might help affected families then these forums are a good place to offer such assistance such as it is. This is the view on the 27th, looking to the Royal armouries from Crown Point Bridge about 8.45am. The river and the canal have merged into one. These 3 photos were taken today (December 29 2015) and show views at the Brewery Wharf area. The first is a close-up of steps that presumably allowed access to/from boats on the river (I don't know the area well enough to know if the structure was already there and has just been displaced). The second shows the steps structure in its context (Crown Point Bridge is in the rear). The third photo is really just for fun (I'm not trying to make light of the serious consequences of the flooding) as it shows some of the loads of sand in the area that was presumably deposited by the flood. The water mark on the building in the rear may indicate the height that water reached. I'm surprised nobody had (yet!) made sand castles! View of the steps structure by the River Aire near Brewery Wharf (taken Dec 29 2015). View down the River Aire to Crown Point Bridge (taken Dec 29 2015). Ready for sand castles building by the River Aire near Brewery Wharf (taken Dec 29 2015). PS. Your photo LS1 is staggering, showing extremely well the seriousness of the flooding. This was pool bridge, over the wharfe.